Do you know what creeps me out in a garden? Faces molded into the sides of containers. Faces in stepping stones. Faces attached to heads that just sit in the garden, sans bodies. Faces attached to trees. Faces that get mounted on walls. I feel like I’m being watched by those faces. And there are enough neighbors and rabbits watching me that I don’t need to add to that feeling with a bunch of other faces. 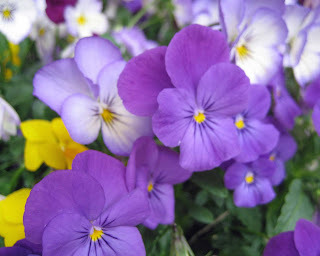 The only faces I want to see in my garden are on the pansies and violas. The other day, I looked at the big boulder that sits in my vegetable garden and gasp, I saw a face in it. See the lips? See the dents where the eyes would be? Is that not a face? Don't you see it? Squint a bit and you'll see what I mean. great, carol - now you've got me afraid to put out my buddha head. I don't mind faces in my garden, as long as they have bodies to go with them. No floating heads for me, thanks! I'm not one for faces either. I think the center of violas look like angels. I like bunnies but not other faces. We sure sell a lot of them at the garden center though and especially those that go on trees. One of my favorite things is music played in the garden while I'm working. I like the old celtic classical that was played in the appalachian mountains long ago. It's great for gardening. Gina, if it is the whole buddha, I'd put it out in my garden, but not just the head. Sorry... that's just me. Cinj, I'm not really capturing the "size" of the boulder in that picture. It is about 3 feet across, so there will be no "flipping it over". Robin's Nesting Place, That's a nice thought about the violas, I'll have to remember that. Anna, I know a lot people buy heads to put in their garden, so I hope I haven't offended anyone. To each his/her own! As for music, just nature sounds for me. I have faces in my garden too ... the tree faces (which don't appeal to everyone), my peeker face (new this year) and all sorts of gnome and critter faces ... not to mention all the flower faces that our imagination sees. I do see the lips. Creepy. Nothing is creepier than what looks to be a child standing up with no arms or head and flowers growing out the top. Funny Carol. I have a few faces in the garden. I think of them as company. ha... I do think finding a big set of lips in your garden might be disconcerting. Don't you wonder who they might belong to?? How did those lips get on the rock? Maybe a little lipstick might make them not so creepy. tee hee.. I thought I was the only one spotting faces on things. I guess thats how it goes, Catholics see the Virgin Mary and Christians see scary faces. lol. On one of our garages walls on the outside, the paint on the plywood surface is chipping away because of weathering and I swear it's chipping away into my silhouette...I noticed it one night when I was standing in the back doorway in the kitchen, the light from behind me casted my shadow perfectly inside the area the paint has chipped away on the garage wall. I think that's even more creepy than seeing a face when something starts mimicking you. lol. One time at night I went outside to smoke and the garage door was open but the light was out and I was looking into the garage...I thought I saw a huge mountain lion or panther or something in our garage but it turned out being some brake light reflectors (which I thought were cat eyes) on an electric scooter that accidentally got uncovered. That scared the crap out of me, I just froze in place. lol. I hope this doesn't creep you out too much but, I have a Venus bust in the garden, well, actually, just the head. We put sunglasses on her during the summer and pearls for more formal evenings. I see dinosaurs in my rocks, does that count as a face? Pansies are sweet with their upturned happy faces. Carol, LOL--just what are you up to that all those eyes shouldn't be seeing? I'm envious! BAHAHAHAHAHA Yes, I see the lips-- I love that rock! I will confess that I like faces. Except I don't like those faces they stick on trees for some reason. I love gnomes, rock faces, sun faces, moon faces-- I think you would have to close your eyes in my garden. Carol, you'd be freaked by my head of Medusa. She's my only disembodied face. Frances, Happy to read you don't take offense. 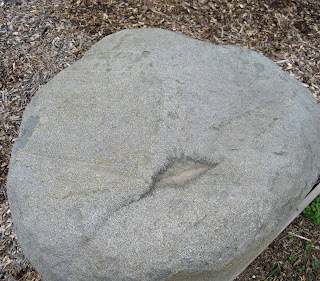 You can have all the faces you want in your garden, but no lipstick on the boulder! Crafty Gardener, I'll have to stop by and see all your faces. Sherry at the Zoo, Good, it's not just me, must run in the family. SuzyQ, I'm with you, creepy. Lisa at Greenbow, I don't know why I never noticed those lips before, and that boulder has been in the garden since the beginning, 11 years! Garret Sawyer, Just goes to show that sometimes we all see things that aren't really there. Muum, I think I'll pass on the lipstick idea and I am glad I don't have squirrels in my garden, so far. Nancy J. Bond, They are my favorite faces, too. Gail, Is that Venus head on the ground? If so, that's creepy. The Garden Fairie (Monica), Nothings going on in the garden worth seeing, I swear! Brenda Hyde, Yes, I might have to see your garden quickly and avoid all the faces. JeanieTheDreamer, Who knows, maybe someone was watching you through the hedge? Pam/Digging, I'm not sure it is a phobia, just kind of something that I find 'disconcerting' in some cases. Your head was okay. Thanks all for looking at my boulder and seeing the lips, too! Carol, I can understand why you find them creepy. Some I don't mind, some, to me are creepy too. I do love the pansy faces. I have many faces in my garden, but I don't find them creepy at all, I find them friendly and comforting. I have them in the house too, scribed on particularly amazing pieces of rock I have picked up over the years. Carol, you have inspired me to do a post featuring the many faces in my garden. Hope it doesn't creep anybody out. Garden Girl, Yes, there are a few faces in the garden I don't mind, but not many. Healingmagichands, I look forward to reading your post. I hope it doesn't creep me out too much, either.